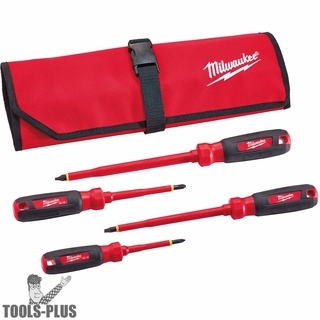 Milwaukee 1000V Insulated Screwdrivers are the only UL Classified screwdrivers tested to International Electrotechnical Commission (IEC) 60900:2012, ASTM F1505-10 & National Fire Protection Association (NFPA) 70E standards and meet the OSHA insulated tool requirement. Providing an uncompromising safety rating, Milwaukee Insulated Screwdrivers are flame retardant and impact resistant and feature a dual layer insulation for maximum protection and a visual wear indicator to issue a replacement warning to the user. These high quality screwdrivers reduce incidents such as electrocution, arc flash and arc blasts. Don't be fooled by rubber coating on common hand tools, they are just there for comfort and are not thick enough with adequate dielectric properties. They will not provide the protection from electricity. Remember, only use insulated tools that are marked with the official international 1000 volt rating symbol.